Letter writing it seems is a dying artform. Lots of people say, "Oh no! I don't write letters anymore. I just send emails." True at one level. I can type much faster than I can write with pen and paper these days. But it isn't true at another level, because how many of us actually correspond with others via email? I send lots of emails - but they are mostly short, usually on one subject, written with the aim of getting something done. I think I am keeping up with those who are beyond my immediate vicinity. But actually, I'm not. Because I rarely write a letter these days. I think I have had two bursts of letter writing this year. And I don't seem to get around to writing emails that would count as correspondence all that often. This year, with my friends in Kiribati, I have been trying to keep in touch regularly. Telephone calls haven't really been an option, although there have a been one or two lovely phone conversations. I have written them two or three letters - and they do get there but it takes about three weeks. Which is good, really. But mostly I have been emailing. Sometimes I hit a busy patch (or so I perceive it to be) and I don't email for a while. But in recent months I have decided that I'm sure my friends would rather get a short email that not hear from us at all. It's the keeping in touch that counts. And so one day, in the midst of a busy patch, I had twenty minutes exactly. I can't remember what it was that was happening on the otherside of the twenty minutes...time to collect the children from school, time to start preparations for tea...no matter. I had twenty minutes. Not the sort of twenty minutes that might be useful for a quick job inside utilising one or other packet of cleaning wipes or twenty minutes that could be gainfully employed with a quick stint of weeding the garden. It was the sort of twenty minutes that would be spent quickly roaming around facebook and google reader. But instead of taking a wander through the hallowed halls of the internet I opened up an email and started to write. And a week or two ago I even went above and beyond and used a couple of twenty minute slots to write short letters. Yes. Pen and paper. Do you have someone whose day would be made by receiving an email or a short letter? Twenty minutes is surprisingly easy to grab at some stage in the week. Then it is a bit like an exam. When the clock says, "Your time starts now," you just have to get busy and start writing. Have a go. It will make someone smile and be such an encouragement to them. Sometimes, if the term challenge is getting a bit tired or the class is getting a bit tired - and take it from me, children in their final year of primary school start getting a bit on the tired side about half way through term three - it is a good idea to throw in a bit of one-off fun just to wake everyone up and get them all back on board again. So one lesson last term I took in a big bowl of minties to my Scripture classes. 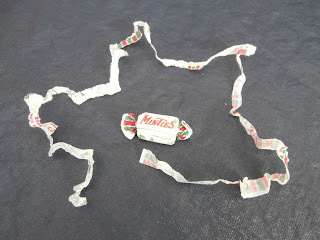 Activity one - everyone got a mintie with strict instructions not to open it or eat it. The kids had to balance their mintie on their head while I started the lesson. If it fell off their head they were out of the game and it was a competition to see who could balance it for the longest. When it had gone on for too long I got the final contenders standing, turning circles and doing star jumps until we had a winner. 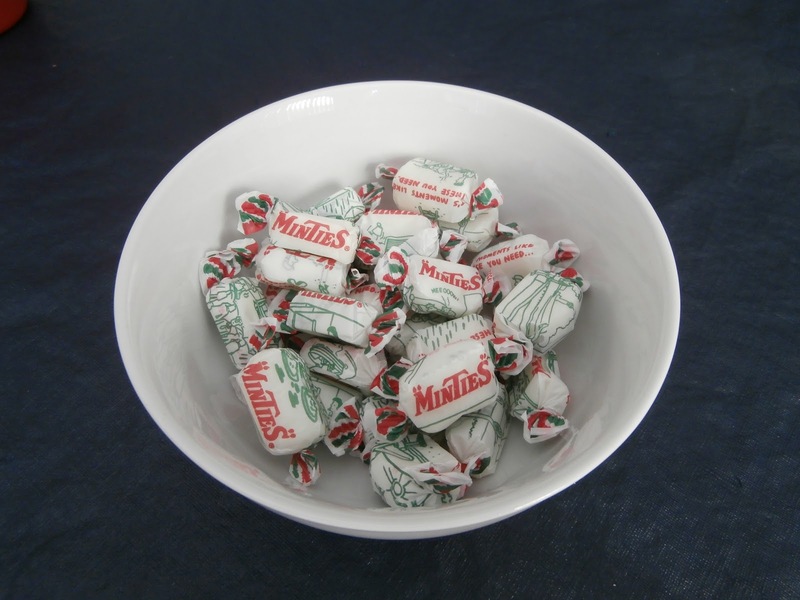 Everyone still had to keep their mintie wrapped and on the top of their desk. All the winner got was the glory, which is a lesson in itself for some kids. Activity three - two children up the front (a boy and a girl or one from each side of the classroom for a bit of competition) seeing how many times they could throw their mintie up in the air, clap and catch it in the space of 39 seconds (because there are 39 books in the Old Testament.) This was helpful for giving the kids a break midway through the discussion about the passage. 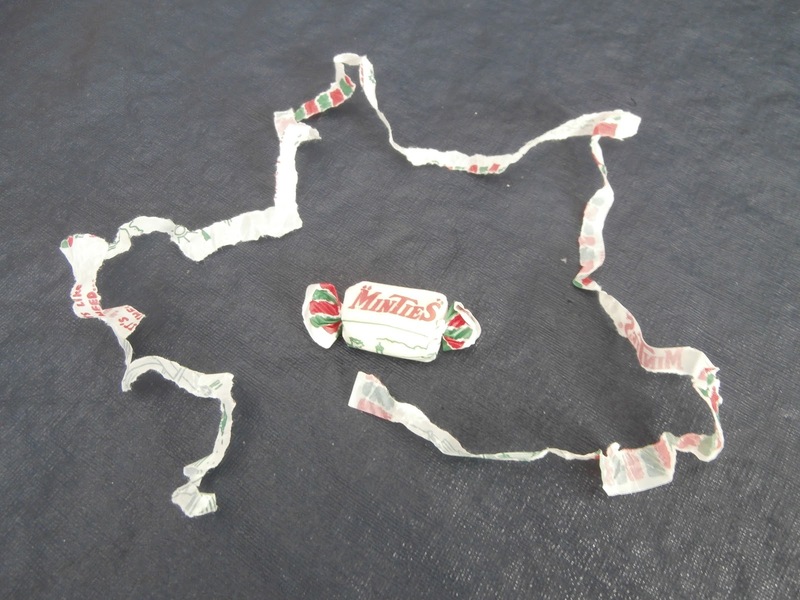 Activity four - at the end of the lesson, as the grand reward, eat the mintie and do the old tearing the mintie wrapper competition to see who can get the longest strip. In only a minute because time is short in a 30 minute lesson. No book work done that lesson. But lots of Bible reading and discussion. And the children remembered the content of the lesson the following week. Warning: Minties are very chewy lollies. I wouldn't use them in classes with young children who have mouths full of wobbly teeth. And always get permission from the classroom teacher before doling out vast quantities of lollies. At about the same time my Sunday School class was also getting a bit tired so I brought along a big bag of marshmallows. Marshmallows, because I have a couple of young children with lots of wobbly teeth in their mouths. We spent some time practising memory verses with marshmallows balanced on our tongues. You could do the "fluffy bunny" game by seeing how many marshmallows you can fit inside your cheeks and still speak/recite your memory verse but this seems such a scurrilous waste of marshmallows to me. Then a little later on we switched out all the lights in the hall (evening a.k.a. 5pm church) and roasted marshmallows on satay sticks over tea light candles. While we were sitting around our "campfire" we chatted about what we'd been learning during the term, about what it is like to be a Christian, about prayer and lots of other good things. We reconnected as a group and it has been so much better ever since. Moral of the story - sometimes you just have to pull out something out of the ordinary to shift things back to where they work best. And it can take a surprisingly simple gesture to do so. Back here I presented a few timed challenges I have used in Scripture and Sunday School lessons. 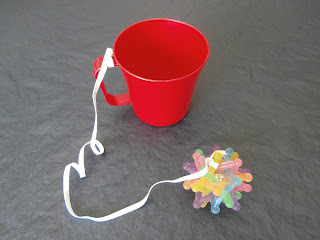 The point of them is to inject some quick fun into a lesson - good for building relationships and for breaking up the teaching time so that kids can keep their concentration. 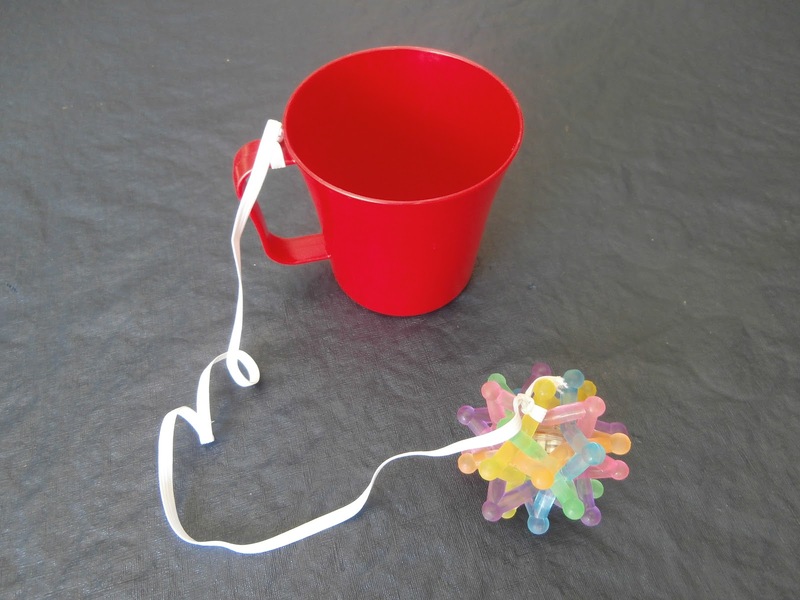 ...a ball tied to a cup with a piece of elastic. This particular ball (if you can call it that) lights up on impact just to make it a little bit more fun. The idea of the challenge is to count how many times you can catch the ball in the cup in a specified length of time. In our case, we used the old 27 seconds (because that's how many books there are in the New Testament) and the record was an astonishing 18. I gave lots of reasons for using funny little challenges during teaching times with kids here. Another reason is that something like this doesn't require a lot of equipment, which is especially excellent for Scripture teachers who are lugging of box of tricks from one classroom to another, trying to run 30 minute lessons with no turn around between classes. In these instances it is very good to keep things simple. WARNING: Three of the classrooms I teach in had interactive whiteboards installed during the term. It is important to position any participant of this activity well clear of low hanging data projectors (or ceiling fans or displays of artwork strung across the classroom). Taking out the classroom data projector is very bad PR for a Scripture teacher. 1. The exercise of thanksgiving for all that we valued and enjoyed in the person we have lost and, in the case of a believer, for the happiness to which we know he or she has now been promoted. 2. The exercise of submission to God, as we resign to him the loved one he has taken from us, confess to him that we had no claim on the continuance of that loved one's earthly life, and consciously put ourselves in his hands for whatever future experiences he has in mind for us. 3. The exercise of patience, which is a compound of endurance and hope, as we live through our bereavement on a daily basis. Richard [Baxter], in his sadness at losing Margaret, transparently models all three in the Breviate. Lewis, mourning the loss of Joy, does the same in A Grief Observed. From the section "The Sanctifying of Grief" from A Grief Sanctified by JI Packer, pages 188-189. 1. The reality of God's sovereignty - that we, like everyone else, are always in his hands, and neither bereavement nor anything else occurs apart from his overruling will. 2. The reality of our own mortality - that we, like everyone else, are not in this world on a permanent basis and must sooner or later leave it for another mode of existence under other conditions. 3. The reality of heaven and hell - that we leave this owrld for one or the other, and that we should use the time God gives us here to unsure that as saved sinners we shall go to heaven, rather than as unsaved sinners go to hell. From the section "The Sanctifying of Grief" from A Grief Sanctified by JI Packer, page 188. All life, said the Puritans, must be managed in such a way that it is sanctified; that is, all activities must be performed, and all experiences received and responded to, in a way that honours God, benefits others as far as possible, and helps us forward in our knowledge and enjoyment of God here as we travel home to the glory of heaven hereafter. Of the experiences to be sanctified, some are pleasant and some are painful. The Puritan labels for the latter are "afflictions" and "crosses"; and bereavement, with the grief it brings, is one such. How may an experience be sanctified? By relating it to the truth of the gospel, so that we understand it in biblical and evangelical terms; by letting it remind us of truths we might otherwise forget, or not take seriously; and by disciplining our hearts to accept it in an appropriate way - with gratitude or self-humbling or whatever. From the section "The Sanctifying of Grief" from A Grief Sanctified by JI Packer, pages 187-188. 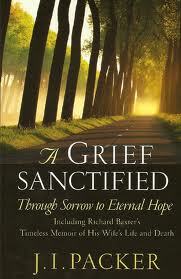 I've just finished reading A Grief Sanctified by JI Packer. It includes Richard Baxter's breviate - think A Grief Observed by CS Lewis but written 1681 - written soon after his wife Margaret died. Richard Baxter reflects on Margaret's life and deep faith, her gift to him as his wife, her suffering and her death and then his own grief. JI Packer has taken Baxter's breviate and included it in the book A Grief Sanctified, with a few editorial changes and explanations. Either side of the breviate itself, Packer has drawn some of his own conclusions on the Puritan experience of life, marriage, death, suffering and grief. It's a fine read, with some sober reflections on the sometimes shallow nature of our modern take on life, marriage and death. Which is not to say that the Puritan experience of life (and death) is where our stereotypical thoughts might possibly take us. You know, dressed in black and all very serious and upright. Far from it. Here were two people who loved one another to bits, loved life, loved God and lived lives full of joy, despite all sorts of attendant difficulties. Margaret and Richard Baxter understood sanctification - and they enjoyed some of the immediate benefits of it in their lives. Over the next few days I am going to post a quote in three sections - JI Packer's summary of the puritan experience of the sanctification of grief. That is, how the Puritans managed their grief with a view to bringing God all honour and glory, even the darkest of moments - a view that Packer endorses.